Soulful, reflective, supportive and community building, from acoustic to blues to country to rock. 8. How Wrong Is Wrong? Cassidy’s mature songwriting talents are on full display. with Teresa James, Sally Dworsky & Steve Kobashigawa. of encouraging a supportive and creative musical community. with seniors, children and to people residing in various institutions. 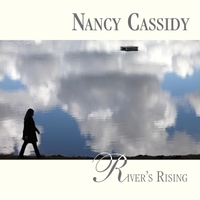 Nancy writes songs from the heart and expresses her feelings imho with great clarity through her music. This CD takes us on the road of the current times in America. It is not downhearted but rather puts you there with hope and inspiration. So, the title song is about river rising which has both literal and metaphorical meaning in November 2018. It is perfect and must listen. Each song, in disguise, takes us on a country rock journey of healing and hope until we get to You're Perfect. This song helps us understand that we are who we are, with our flaws, moths, etc. but if we want to and need to (note the word 'and') we can change. It is a perfect artistic repertoire of music, the cover image depicts a river but it could just as easily show the ocean. Nancy is a beautiful person with a wonderful heart and soul and each word and stanza reflects her soulful and meaningful message. But unlike some songs/CDs, you will be inspired!